Artemisia Capillaris Thunb, Rhizoma Polygoni Cuspidati, Eupatorium Fortunei Turcz, Curcuma Aromatica Salisb, Hedyotis Diffusa Willd, Sedum Sarmentosum Bunge. 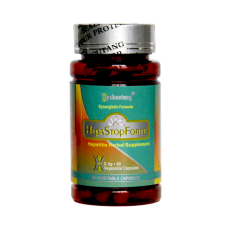 HepaStopForte is formulated for removing dampness hot toxin in liver and gall bladder system from hepatits. HepaStopForte is suitable with patients who have hepatitis.